Gracias a Dios que hemos salido de esas Honduras. (Thank God we have departed from these depths.) Christopher Columbus (1502) upon leaving the shores of what would become Honduras. With one of the highest murder rates in the world, recently overrun by cartels, a history of violence against environmental activists, and hosting a plethora of tropical diseases, Honduras is not the first country you’d think to visit in Central America for birding. But it also contains 23 bio-reserves covering 20% of the country, 9 mountains over 7,000 feet, and a tropical lowland wilderness (famously depicted as the “heart of darkness” in the 1986 film “The Mosquito Coast” featuring two youthful actors in Harrison Ford and Helen Mirren). The murder rate has actually dropped 30% since 2012, and is mostly contained to large cities. Plus, have you ever walked through a coffee plantation while cradling a hot mug of its spirit-lifting product? Honduras today doesn’t look like a terrible destination after all. 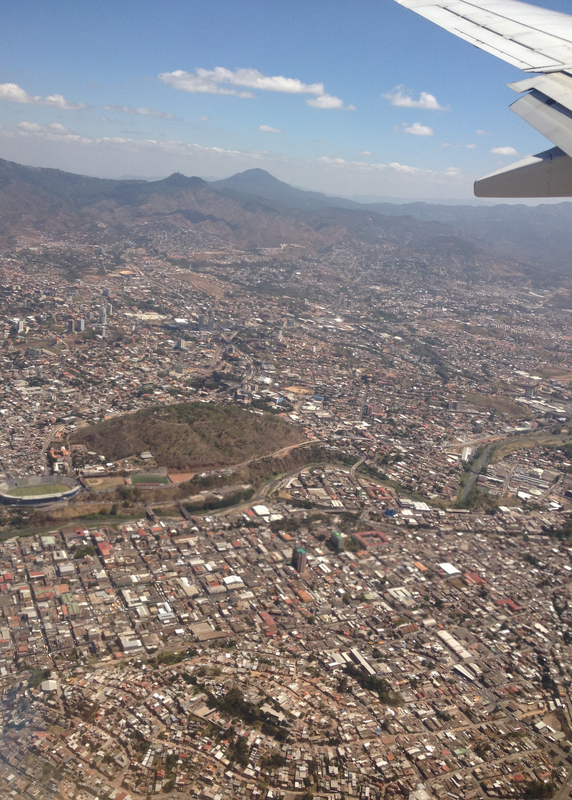 So on February 17, 2016 I flew in to its capital city, Tegucigalpa, a name I didn’t even know how to pronounce. For the next 12 days I would explore Parque Nacional, Reserva Biologica, Laguna, Montana, Bosque, and Vale throughout Honduras with 9 other people from Pennsylvania, New Jersey, and Honduras. Our goal was to learn about the conservation efforts underway in the country and document as many bird species as possible. This adventure was Juniata Valley Audubon Society’s inaugural Birding for Conservation Tour led by Mark Bonta. After the tour, I would spend 8 days volunteering with Ruth Bennett, a doctoral candidate from Cornell University, as she concluded her fieldwork with Blue- and Golden-winged Warblers. First goal after role call and packing gear: food. So naturally we headed downtown to the mall and hit up the food court. After perusing each foreign counter I decided my first Honduran meal ironically would be El Salvador’s national dish, Pupusas, or soft tortillas stuffed with beans and cheese. They were perfect with a few dabs of hot sauce. It’s really a national food pocket, like ravioli (Italy) or dumplings (China) or hot pockets (U.S.A.). Then we all jumped in our 14-passenger van and climbed up to the tallest adjacent mountain, home to the cloud forest preserve, Parque Nacional La Tigra. Most of the interior highlands are carpeted with pine savanna, a landscape more reminiscent of the Ponderosa Pine forests of Colorado than the tropical broadleaf forest lowlands of Belize or Costa Rica. Cloud forests cap the mountain peaks, each acting as a biological island, with unique flora and fauna. Before we made the edge of the parque, our van pulled over along a narrow dirt road at the first sign of Bushy-crested Jays (the most widespread and abundant Corvid in the country). And with these yellow-eyed jays came warblers: eastern migrants like Black-and-white and Black-throated Green, western migrants like Townsend’s and Hermit, and the locally-breeding Grace’s and Crescent-chested Warblers. A Band-tailed Pigeon flock flew overhead as an Azure-crowned Hummingbird darted past my head. I spotted a Brown-capped Vireo, several Yellow-backed Orioles, and a Black-headed Siskin… then one rampaging, blue bird shot down the dirt road we were standing on. We learned to stay vigilant for them from then on. No, it wasn’t an actual bird nor was it blue. Although there are resident Eastern Bluebirds here (one of a surprising number of carryover species from the Eastern US) Blue Bird is an American school bus manufacturer, and this was one of many retired yellow school buses that now have a second life in Honduras. Naturally with absent traffic police, the young and reckless pilots kept their right foot as close to the floor as possible between stops. That evening we stayed at the lodge adjacent to the La Tigra Visitor’s Center. Most of us spent the night shivering, but thankful to not be caught out in the 3am downpour. The temperature had dropped into the single digits (Celsius!) that night, and the rain did not help the bird activity the next morning. Fragrant sweet coffee and the rhythmic chant of Mexican Whip-poor-wills greeted the early risers. Once the sun hit the treetops we made our way to the nearest suave trailhead. Slate-colored Solitaires threw their fluting songs around each shadow-filled bend in the trail, and Common Chlorospingus faithfully emerged with every “pish.” But the cloud forest was clearly in control this morning. A wet fog rolled in with infrequent wind gusts. We still managed to pick out a few mixed flocks within the understory. Mountain Trogons called constantly, Resplendent Quetzals were absent, but we did find a stunning male Golden-winged Warbler! Honduras has one of the highest wintering densities of this charismatic species. 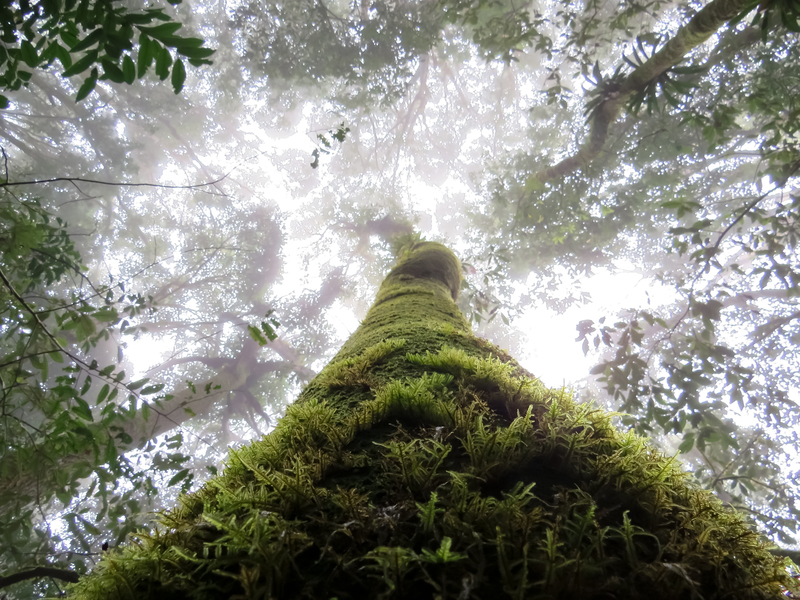 Of course it was in the exact opposite habitat you would expect to find one: the thick humid understory of a montane cloud forest. 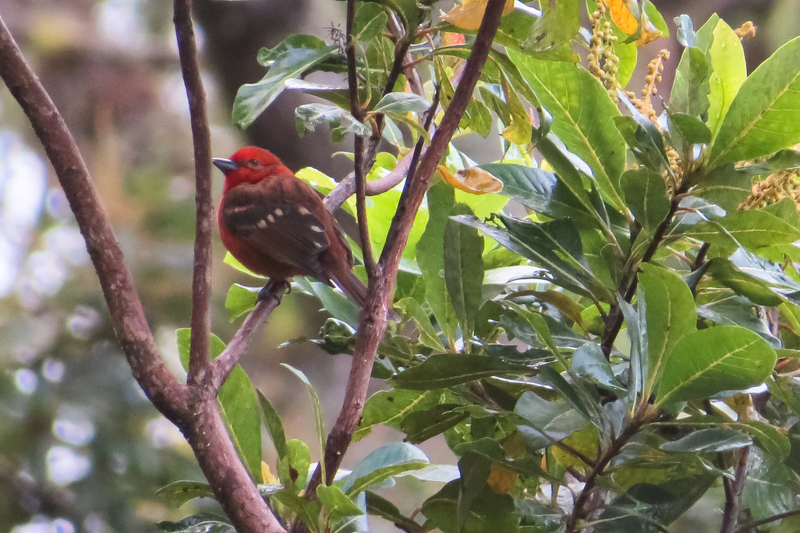 We wandered down the dirt road we drove in on and picked up a few cloud forest specialties like Crested Guan, Flame-colored Tanager, and Rufous-browed Wren. Tennessee Warblers and Common Chlorospingus dominated passing warbler flocks. Then Gilberto, an Ecotourism student and our bilingual guide, picked out a Mexican Violetear’s nest on a roadside bush. 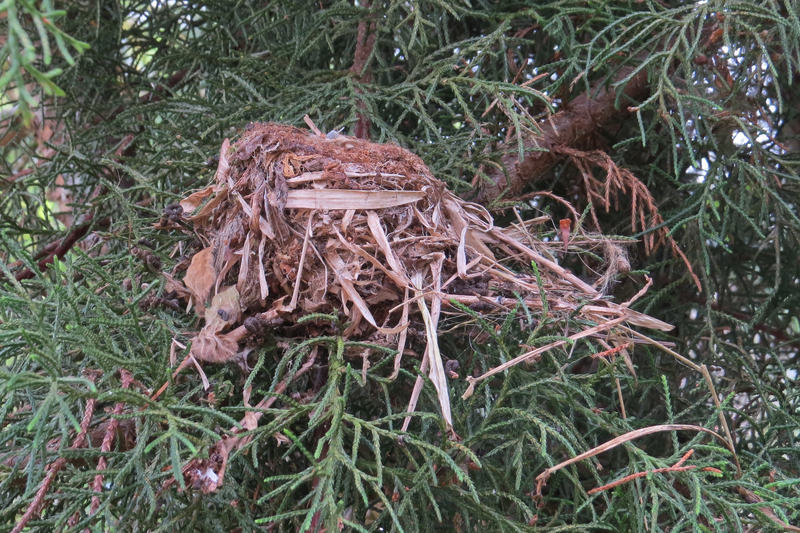 It was difficult to believe he could identify an empty hummingbird nest, so I got closer to inspect and document it. And as I brought my camera to my face a brilliant green and violet hummingbird filled my right ear with a deep buzzing. He nailed it! Our driver, Fito, met us with the van as we hit the parque boundary. We were headed back through Tegus (colloquial nickname for the capital) and out to Honduras’ “wild west”, the department of Olancho. To be continued! We’re planning a return trip to Honduras for this December! Visit our GoFundMe page to learn more about our expedition to La Moskitia and donate to make it happen and see more posts like this! We're planning a return trip to Honduras for this December! Visit our GoFundMe page to learn more about our expedition to La Moskitia and donate to make it happen and see more posts like this!